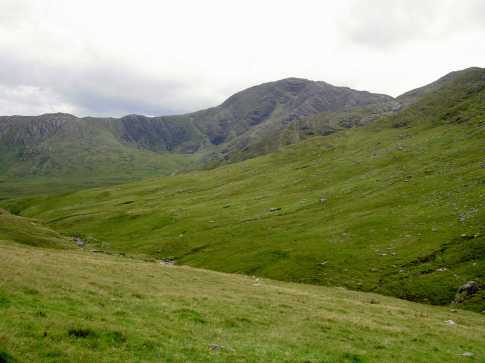 Finnararagh is a corruption of Finnavogagh, the name of an area of rough pasture on the plateau W of this peak. The name is correctly recorded in the Ordnance Survey Name Book, but was misspelt when transferred to the map. 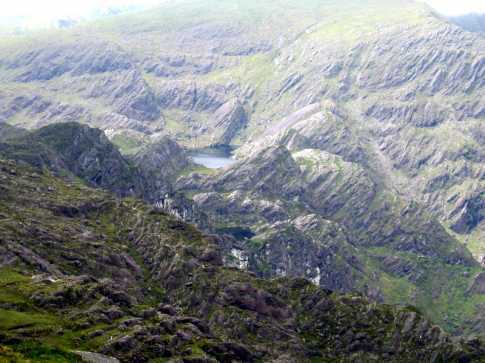 The peak itself is locally called An Corrán, which aptly describes its crescent-shaped cliffs that dominate Lough Coomeen. An Corrán is the 165th highest place in Ireland. Picture from group : The summit from the west. Picture: The summit from the west. 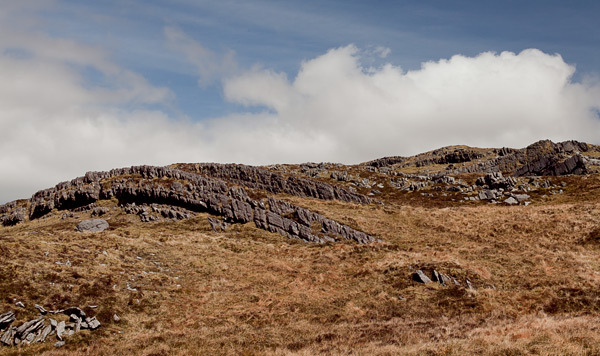 Dramatic cliffs, bogs and rough ground surround this peak. 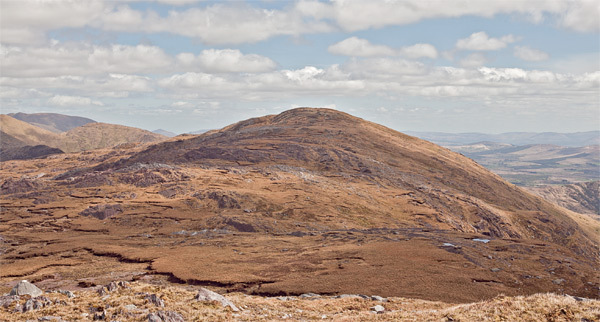 There is dramatic ground all around Finnararagh/ An Corrán however the top is fairly tame and there are fairly easy ways up provided you are careful. From the south you can possibly start on the track leading off the public road at V69259 71239 A. Ask permission at the house there. The track (it's the west of two shown leading from Fermoyle) has a stony surface until you reach the Small River. Head NE for the top. If you veer right you will avoid steeper ground with its cliffs. From the north one way is to park near Cloon Lough at V 708 788 B. Walk up to Coomura then round the River Deecagh valley going past V 688 737 C and up to the summit. I highly recommend Finnararagh. It's not as climbed as the more popular mountains in Kerry like Carrauntuohill and Brandon. I would say this is mainly down to the fact that It's a good 30 minutes drive beyond Killarney. That said on a clear day it offers spectacular 360 degree views. You can see Brandon, Carrauntuohill/Cahir and of course Mullaghanattin. Head in the track on the northern side of Cloon Lough. 1 Make your way for spot height 532m (V 682 758 D). 2 Next go to 666m (V 677 753 E). 3. Next make for spot height 598m (V 688 737 C). 6. Turn east to spot height 636m (V 714 755 H) heading for Mullaghanattin. Continue the ridge to 657m. Then drop down steeply (be vigilant here, steep ground that would be dangerous in foggy conditions) and climb sharply up to 752m (V 726 765 I). There is fence that runs all the way to the top of the mountain. Picture from simon3 : Exposed anticline W of Finnararagh. Picture: Exposed anticline W of Finnararagh. Striding along the scarp from Coomnacronia to An Corrán gives dramatic views to the south, however spare a thought for the geology visible also.